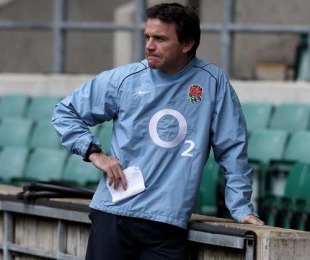 England defence coach Mike Ford admits there is "an air of inevitablity" about him losing his position in light of Martin Johnson's departure from his role as team manager on Wednesday. Johnson urged the Rugby Football Union not to jettison the experience of his coaching team of Ford, John Wells (forwards), Brian Smith (attack) and Graham Rowntree (scrum). Ford, who has coached at three World Cups and helped England reach the final in 2007, expects the new national coach to bring in his own management team. "I think there is an air of inevitability," Ford told BBC Radio Five Live. "We are grown men and we understand that being a coach you are there in the firing line. Your results are there, black and white for everyone to see. "That is the way we like it. We like to win and lose. We like to be out there. The new guy who comes in has obviously got to pick his own coaching team and that is only right and fair. We will see what Rob Andrew has to say to us over the next few days. "There is a possibility he will keep us in the organisation because of our experience, but we will see." Smith is understood to have been sounding out coaching opportunities in Australia while Rowntree, like Ford, is thought to be keen to remain involved with England. Johnson gave his coaches a ringing endorsement yesterday and urged the RFU not to waste their valuable experience. "There is a huge amount of knowledge and experience about what this game is about at this level, the very highest international level, the World Cup," Johnson said. "From my point of view, it would be a waste for that to be lost to the union. There are only so many people who have been through these jobs at this level and understand what it is all about." The England manager spent two days last week undertaking an internal review of the tournament with Andrew, the RFU's elite rugby director. Ford was saddened to hear of Johnson's departure and believes the experience he had gained over the last three and a half years left him well placed to move England forward. The 2015 World Cup will played on home soil and represents a once-in-a-generation chance for England. "It is disappointing because he is a great man and has been a great coach," Ford said. "You have to have experience to become a good coach at international level. "After going through what he did for three years and learning on the job and becoming the man and the manager and the friend he has become, that is why it is disappointing because I think he was ready to take the England team forward to new heights. Although we did really well in the Six Nations ultimately you are going to get judged on the big tournament and we came up short. "I don't know the ultimate reason why Johnno is not carrying on. I feel he feels that it's best for English rugby and himself not to carry on."